As well as corporate thrillers, I love writing short stories; I’m about to pen a bespoke fairytale to raise funds for the Sue Ryder charity. They’ll auction it this week in their Whiteladies Road, Bristol shop and it’ll be written for the winning bidder’s child. 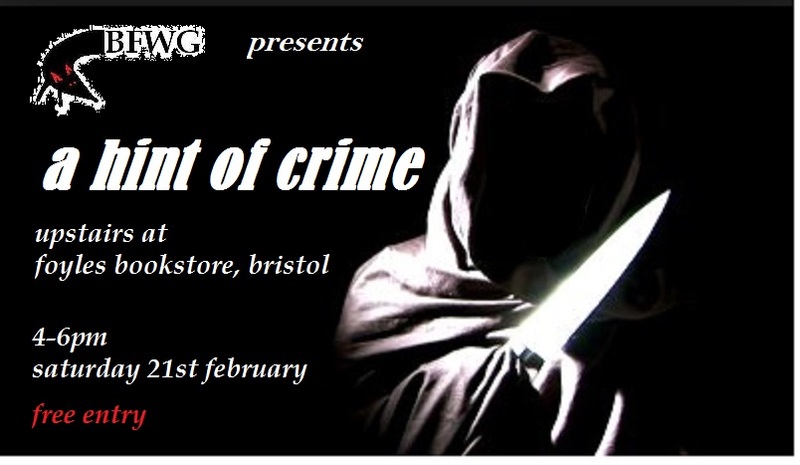 I’ve just written a short crime story too – after the success of the Hearts of Darkness fiction night in Birmingham last week, I’m joining the Bristol Fiction Writers for their Hint of Crime festival in Foyles, Bristol on Saturday 21st February. British crime author Sarah Hilary is also taking part, giving us a sneak preview of her new chiller, No Other Darkness. I love meeting readers (let’s face it, I love meeting people!) but live fiction events offer more than that. They’re also a chance to tell a tale the way I want it to be experienced, with tons of dramatic pauses and tension. You can hear me reading a chapter from thriller Up In Smoke here. I promise you that, short as it is, my new story offers suspense and thrills aplenty, and I’ll be bringing them to life on Saturday. The Bristol Fiction Writers are an interesting bunch, led by Bristol babe Suzanna Stanbury. Suzanna’s own fiction might seem a little schizophrenic: swashbuckling pirate tales for children, and much darker adult stories. Peek inside the Dark Imagined Bristol anthology on Amazon (did you know you click on a book image to look inside?) for a preview of the group’s style. Foyles is a lovely bookshop, friendly to both writers and readers (they’ll happily offer you a free coffee if you buy a few books from them – how good is that?). Their event space is upstairs, near enough to bookshelves to browse if the fancy takes you but with plenty of chairs if you want to sit and listen. Best of all, the Bristolian writers are bringing great stories and a dash of theatrical style. Chills, thrills and spills are guaranteed – so if you’re in Bristol this Saturday, what are you waiting for? Join us for this free event at Foyles, from 4-6pm. STOP PRESS: the Foyles event was really good fun, with an appreciative and friendly crowd of readers. If you’d like me or a group of writers to read stories at your venue or event, please get in touch. Simply email aaabbottstories[at]gmail.com. As a thriller writer, I appreciate St Valentine’s Day more for the opportunity it presents to move a plot forward, as love blossoms at the water cooler. It’s not just about sweet, sugar-coated romance, either. The anonymous presents and cards bestowed on cheating Gemma in thriller Up In Smoke set tongues wagging, and posed a problem – had her partner sent the chocolates or the flowers to her office? She dealt with her dilemma very cleverly, telling her partner they were so gorgeous, she left them at work so everyone could enjoy them with her… Similarly, thriller After The Interview explores Jed’s enduring passion for music and a beautiful flute player, although it’s played out against a backdrop of double-crossing corporate deal-makers and murderers. I’ll be exploring the darker boundaries of love even further with Donna Marie Finn’s Hearts of Darkness event in Birmingham tomorrow evening, joining other British writers to read live fiction at Brewsmiths Coffee & Tea. Bright, warm and welcoming as it is, the venue has a sinister edge, tucked away under railway arches in the newly fashionable Jewellery Quarter. Donna has organised several events like this, and they’re always great fun. I love being entertained by other writers’ terrific tales, I adore meeting readers, and Andrew and Angela from Brewsmiths can bask in the warm glow of supporting the cultural scene. They make cracking cakes as well. I’ve written a short story set in Birmingham especially for Hearts of Darkness. If you’re in the Midlands tomorrow, why not join us? Entry is free (book your free ticket here), there’s unlimited free street parking, and you’re guaranteed a great time. Thanks to everyone who came along to Brewsmiths last night. It was a great evening, with some fantastic stories of obsession, revenge and jealousy – definitely the darker side of love. Special thanks to authors Ali Elsey, Heide Goody, Andrew Killeen, Giselle Thompson and Adrian Middleton – it was a privilege to join you all on stage.